The caliber that I have settled on as my "favorite" is the .40 S&W. In that caliber my choice is the GLOCK 22 pistol. Now don't get me wrong. I love shooting everything from a .22 to a 50 cal. Dessert Eagle. But week after week bullet after bullet, the .40 is what I shoot best. And of the .40's I shoot my customized G22 best of them all. To be able to reload, I purchased and installed a Bar-Sto semi drop in barrel which turned the already accurate pistol into a remarkable shooter that hits what it's aimed at so ably that it is actually startling. Putting in the "semi drop in" barrel was another story. Bar Sto claims that their barrels just drop in about 70% of guns without fitting. Well, of course mine was one of the 30% that the barrel would not even come close to fitting in. The barrel can be fitted by a non-gunsmith owner with some careful diamond filing of the hood of the chamber. 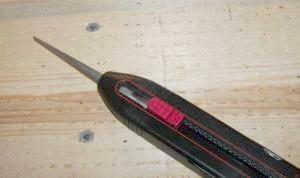 The diamond knife sharpener below is what I used primarily to fit the barrel to the slide. Once in, I installed a rear adjustable sight and a tritium front sight that looks like it's radioactive and glows like something from outer space in outdoor light. Least important functionally, but satisfying personally is that the profile of the GLOCK is improved considerably (it looks better) with the installation of these components. 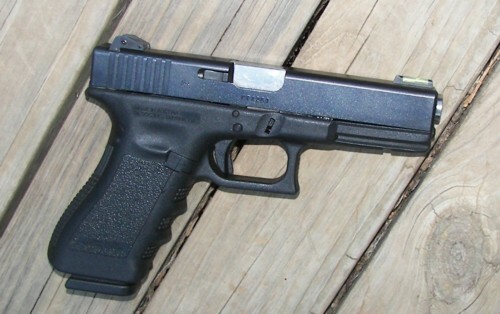 The G22 is built on the same frame as the G17 and will fit a wide range of sizes. And in this full size pistol the .40 S&W loads are manageable and fun to shoot. It is also comfortable to carry concealed all day in casual summer or winter clothes. Whether you buy it and shoot it just like it comes or decide to customize it to your liking, you can't go wrong with a GLOCK 22. NOTICE: My finger on the trigger in many pictures on this site is not an oversite or disregard for safety. It is to illustrate how a handgun grip fits in my hand when ready to shoot.